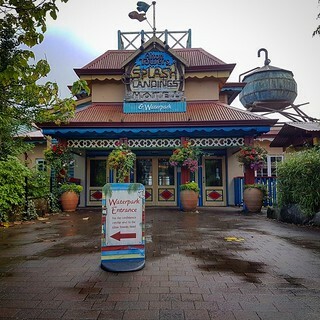 Splash Landings Hotel – TowersStreet - Your premier Alton Towers guide! Welcome to Splash Landings, where the world is on vacation! This wacky Caribbean hotel has some of the craziest plumbing ever seen. Whatever the weather outside it is always tropical in Splash Landings. Don’t forget it’s also Europe’s first water park hotel, so you will have lots of splashtastic fun! Splash Landings Hotel is a much more vibrant and busy atmosphere than it’s sister, Alton Towers Hotel. The Caribbean theme over at Splash is a big hit with children, with bright colours and wacky plumbing detail. Cariba Creek, the Alton Towers Water Park, is located at the back of the hotel and most public areas have windows overlooking the water park. The entrance to the water park is not very well signposted from the outside, but if you enter Splash Landings and head downstairs to Flambos, then down again as far as you can, you will find the entrance. Splash Landings is certainly the more younger-family orientated of the two resort hotels and most of the children’s entertainment is located here. There is also very little outdoor space to explore at Splash Landings with only a small patio area outside Ma’Garritas bar, though you can take the sky-walk to Alton Towers Hotel which has a large garden surrounding a small lake. Be aware when booking your rooms that, unless explicitly stated, only bed and breakfast is included in the price of the stay. The theme park, waterpark and Extraordinary Golf all incur extra charges, which can be added at the time of booking or during your stay. 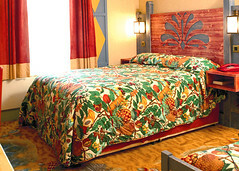 There are various packages available when booking, so take the time to check out your options. The standard guestroom at Splash Landings Hotel has a lively Caribbean theme and contains a double bed and a combination of bunk beds and pull-out beds depending on how many people it is set to accommodate (rooms are available in 4, 5 & 6 berth). 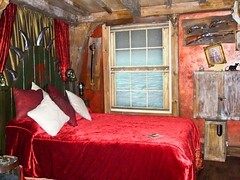 This swashbuckling room is fantastic for any budding pirates, and is themed in the style of the Mutiny Bay area of the theme park. Guests will be fully immersed in the pirate adventure, with many treats and secrets to be found! A mysterious chest is just waiting to be unlocked to find the treasures within… but what will you find? 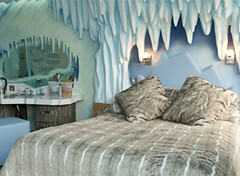 From the tropical heat of the Caribbean to the freezing Ice Age, but you’ll be snug as a sloth as you join Sid, Manny, Scrat and Diego in this fantastic room. The main restaurant in Splash Landing Hotel is Flambo’s Jambo, an “all-you-can-eat” buffet style restaurant offering a range of culinary styles from Mexican to Indian to Asian to traditional British carvery and you’ll find that two or more are on offer every night. With bright colours adorning the walls, seats and even staff uniforms, you’re sure to have an eye-opening experience. The atmosphere within the restaurant is slightly more child-friendly and relaxed than you’d find at the Secret Garden over in Alton Towers Hotel, and you’ll find Caribbean music playing in the background alongside the buzz from Ma Garrita’s floating through the area. 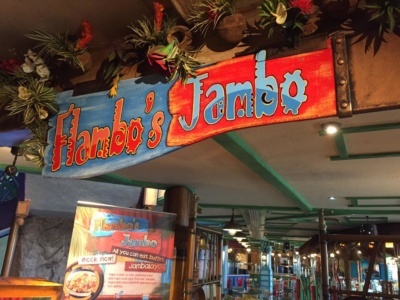 The restaurant originally opened as Flambo’s Exotic Feast in 2003, but became Flambo’s Jambo in 2017 after a small refurbishment. Ma Garitta’s is Splash Landings exotic bar, serving hot and cold drinks from around mid-day until late into the night. The bar is also the location of the children’s entertainment at Splash Landings and is often very busy with families (and can get quite loud!) until around 11pm. After 11pm Ma Garrita’s is the resort’s late bar and can stay open until around 2am on some evenings (with Dragon Bar at Alton Towers Hotel closing between 11pm – midnight). All the usual bar products are available at Ma Garitta’s including adult’s cocktails and children’s alcohol-free cocktails, wine, spirits, alcopops and a range of draft beers. Located at the back of Ma Garrita’s bar with views of the waterpark is the paradise cove pizzeria serving a selection of pizzas, pastas, salads and desserts. As well as a full childrens range. This restaurant opened in 2014. If you feel peckish during the day but don’t fancy a full meal from either of the restaurants, then light snacks and drinks are available at one of the resorts Coffee Shacks. The Coffee Shack is situated outside the entrance to Flambo’s Exotic Feast just underneath reception and also outside the main Splash Landings entrance (near the water fountain). At both outlets you will find sandwiches, paninis, crisps and other nibbles available alongside hot and cold drinks. Following the success of the £20million Alton Towers Hotel, Alton Towers set to work planning their second installation. After many years spent on the drawing board with various concepts, Splash Landings Hotel and the Cariba Creek waterpark were born. Splash Landings is based around a sleepy Caribbean village, where a series of giant geysers had recently started erupting in many different locations. In an attempt to save their village the local residents called in the Paradise Plumbers, Crazy Bob and Mumblin’ Pete, to reroute the water away from the village, using all their mixed up plumbing know-how. The result of the Paradise Plumbers work saved the village from flooding, whilst creating all the fun of Cariba Creek for visitors to enjoy. When the hotel first opened, the Paradise Plumbers were costumed characters who roamed the hotel, along with Ma Garitta, proprietress of the local bar, and Baby Bear, who had previously been a mascot in the Alton Towers Hotel. Unfortunately it wasn’t all plain sailing. The £30million Splash Landings complex opened on 1st June 2003 to much criticism. The hotel and water park were both described as a building site rather than a hotel complex, with much work still taking place in and around the hotel. Problems started right from the entrance, with the iconic ‘mine’ water feature incomplete and the entrance structures still being built. Once inside the issues continued, with workmen wandering around the hotel finishing various other features and decoration still taking place throughout the hotel’s public spaces, whilst in the waterpark, only the main lagoon was ready for swimmers, and the Master Blaster not yet in operation. Alton Towers later admitted that the hotel was not ready for guests and closed it while work was finished, blaming the poor weather on causing the project to fall behind schedule. Guests who had stayed during this time were offered compensation by the resort. Once work had been completed on the hotel, the quality of the workmanship shone through and the late opening was soon overshadowed by the immersive atmosphere. The new complex soon became a firm favourite with hotel guests, offering a truly unique break in the Staffordshire Moorlands. Unlike the Alton Towers Hotel, when Splash Landings originally opened all the rooms were standard Beachcomber Rooms with no themed suites. 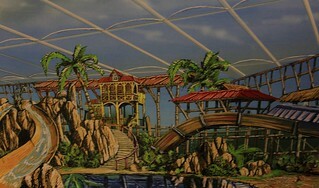 However in recent years this has changed, with the Captain’s Quarters Pirate Suite being added in 2008 to coincide with the addition of Mutiny Bay, and Ice Age themed rooms arriving in 2012 to celebrate the opening of the park’s 4D Cinema. 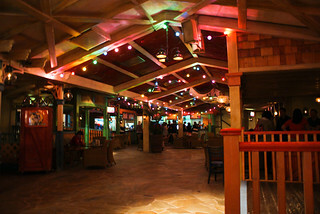 The other notable addition to the hotel’s line-up was the opening of The Coffee Shack in 2010, to offer more variety of food options within the hotel. Minor modifications seen around the hotels in recent years include addition of the giant deckchair photo opportunity in 2010 and updates to both the external water features during 2011 (which also saw the hotel’s signage changed) and internal water features during 2012, with the umbrella cascade replaced by a leaking pipe structure.